Intellicyt, A Sartorius brand is the market leader in suspension-cell analysis. 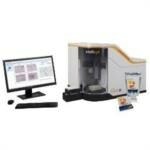 The Intellicyt® iQue Screener PLUS platform is a high throughput, suspension cell analysis platform that enables researchers to rapidly profile cell phenotype and function in biologics, small molecule, and cell therapy discovery workflows. Based on flow cytometry but built for screening, the system allows researchers to automatically acquire and analyze high content, multiplexed assays needed to assess immune cell function by combining cell immuno-phenotyping, cell health, and secreted protein (cytokine) analysis in every well of microtiter plates.